Pau has a rich past in motorsport and the circuit is one of the great street circuits in Europe offering superb vantage points and a relaxing ambience with the snow capped Pyrenees in the far distance. The Historic Grand Prix of Pau is the oldest Grand Prix race in the world and was the first to use the name "Grand Prix" in 1900. The unchanged street circuit in the heart of the city has seen wonderful duels over the years involving such legends as Fangio, Ascari, Brabham and Moss. The first Grand Prix Historique was in 2001 and the number of grids increases every year. 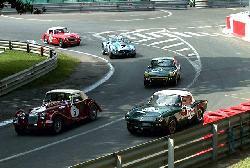 For the Pau Historic race weekend, the roads are closed to local traffic on Saturday and Sunday. Perhaps the track can be best described as Monaco with trees! The Pau circuit is set in parkland, with many twists and turns; there are great free viewing points to be found some 20 metres above the track by looking down from the town and in the centre of it all is a leafy paddock area full of historic cars. We are committed to offering a range of motorsport tours. 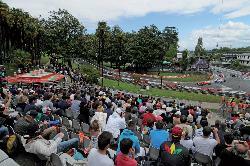 Some are popular events en masse and others, such as the Pau Grand Prix are not. However, we are able to offer any tailor-made tour for a group to enjoy the superb circuit at Pau and to indulge in a historical past.
? 09:25 - 13:00 FIA Lurani Trophy, F. Ford, Maxi 1 000, Endurance GR pre-1977, F3 Classic, F1 pre-1966. Track laps are available for this event - the cost is £140 per car for 30 mins on the track. Only available with a full travel package & tickets. The Kyriad Hotel La Rochelle Centre is a 3-star establishment which has been fully renovated and is the ideal base from which to explore La Rochelle. You can enjoy the tranquil nature of its location and its proximity to the large shopping centre. You can park your car securely in our free car park, which is locked and has video surveillance. The Mercure Bordeaux Château Chartrons is located in the former wine merchants' district and still has its Victorian facade, giving it a distinct identity and a style that blends in with the city architecture. Approximately 1.5 miles to the city centre. There are 144 rooms combining comfort and refinement. The Le Chais Saint Louis Brasserie offers traditional food served on the patio in nice weather. There is a private paying car park. The 3 star Best Western Continental is excellently located in the centre of the historic city of Pau, with its sweeping views of the Pyrénées. It is in a fine old building built in 1912 - with period furniture, spacious, well equipped bedrooms, free Wi-Fi and a restaurant offering 'creative cuisine'. There is limited availability for free parking. Restaurant closed Sunday.